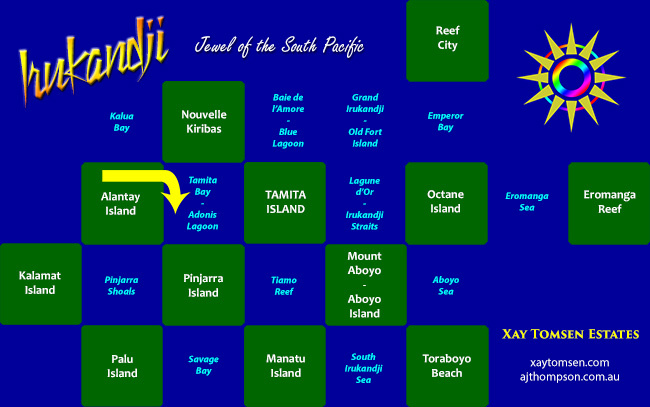 NOTE: This page is about Tamita Bay in InWorldz. The Second Life version is here: Tamita Bay in Second Life. 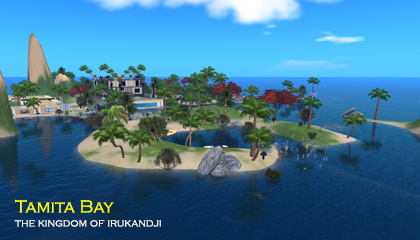 Tamita Bay on the InWorldz grid is part of Tamita State in Central Irukandji. 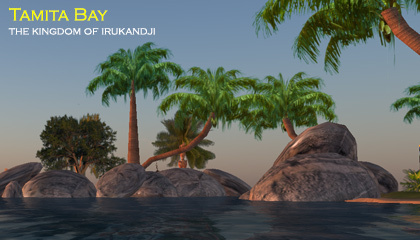 The region continues the Irukandji story faithfully, and occupies the exact same grid space as it did in Second Life several years before. 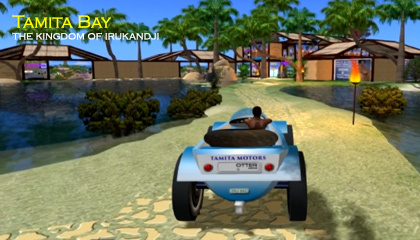 The design of Tamita Bay in InWorldz draws its layout concepts from the earlier short-lived version of Tamita Bay on SpotOn3D, i.e. a central social area connected to the palace district on Tamita Island by a land bridge. In the case of the earlier version, this was achieved with an elevating walk way, giving off a very regal and formal air, while in this new version of Tamita Bay, I opted to make the link via a less formal finger of land. At the centre of the Tamita Bay, a large lagoon was surrounded by low grass dunes. The effect I aimed for was one of nature reclaiming some lost temple ruin from long ago, and to that end, the bottom of the lagoon had a luxurious marble floor. This area was subdivided from the surrounding bay and called Adonis Lagoon to give the parcel a sense of seclusion and romance. The effect was really quite beautiful and the area well utilised by locals and visitors. That magic made Tamita Bay an ideal backdrop for photo shoots as well. Many of my product boxes and land promo posters featured the pretty lagoon, and I know many people who took their profile pictures there. Tamita Bay was also a major hub for getting around the islands. Irukandji's bush highway, the Inter Island Causeway crossed through the edge of the lagoon, connecting Tamita Island in the east with Alantay Island in the west. The waters of Tamita Bay arrived via the Maskari River from Nouvelle Kiribas in the north and Alantay Island, and the Aboyo River in the south via Pinjarra Island and Tiamo Reef. Other regions that adjoined Tamita Bay were Pinjarra Shoals, Kalua Bay, and Baie de l'Amore. Around half way through my time in InWorldz, I re-themed parts of the estate to attract new visitors, and the affected sims were renamed in order to protect their previous heritage. Tamita Bay was one of those sims, which in late 2013, assumed the name of its prior subdivison, Adonis Lagoon. 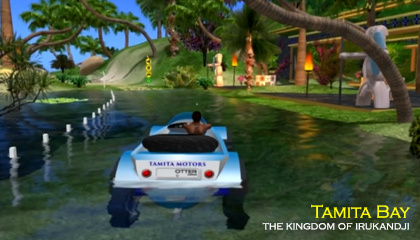 Below is a gallery of photographs of Tamita Bay on the InWorldz grid.